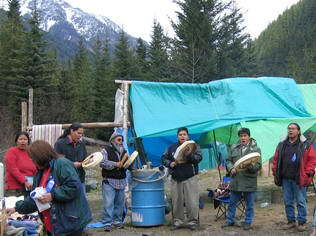 Sutikalh camp protecting the Melvin Creek watershed from resort development, St'át'imc Territory. Melvin Creek watershed, Cayoosh Mountain Range. The Melvin Creek watershed (left) was formed following the retreat of the last glacial period. This land has been occupied and used by the St'át'imc for thousands of years. 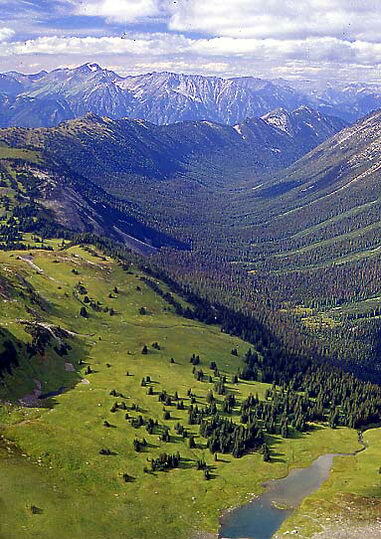 Today it is one of the last two unlogged valleys in St'át'imc Territory. In 2000, without consulting the St'át'imc, the BC government gave permission to a development company to build a $500 million all season resort here, with an initial 14,000 person capacity. 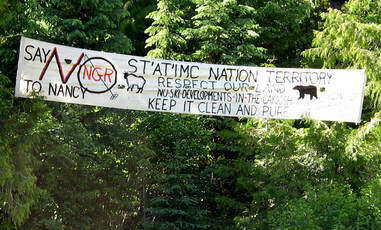 On 17 August 2000 the St'át'imc Chiefs Council unanimously rejected the development plan. The Council's position has not changed in six years. 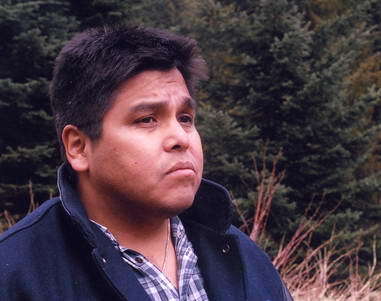 In 2004 the St'át'imc Land and Resource Authority released its Preliminary Draft Land Use Plan: "There will be no land use certainty until our Title and Rights have been dealt with honourably by the Crown. The legal obligations have been made very clear and the provincial representatives have committed themselves to following these. Now they must prove themselves. In the interim, it is our expectation that our land use designations will be respected" Chief Garry John, Press Release, 30 July 2004, St'át'imc Chiefs Council. "This pristine area, we call home, is also home to Grizzly Bears, Mountain Goats, edible and medical plants and all life. The ski resort that Nancy Green Raine, Al Raine and the governments are planning is once again an anti life policy of genocide against our people and our lands and our future generations" (Rosalin Sam, Lil'wat). To date the Sutikalh camp set up to defend the land from being developed has succeeded. But with the 2010 Olympics coming to Vancouver - Whistler, there is renewed pressure. "The Olympics is about railroading destructive mega developments into our territories," says Sutikalh spokesperson Rosalin Sam, "The 2010 Games are not green games, all they have brought to our territory so far is destruction and environmental devastation." 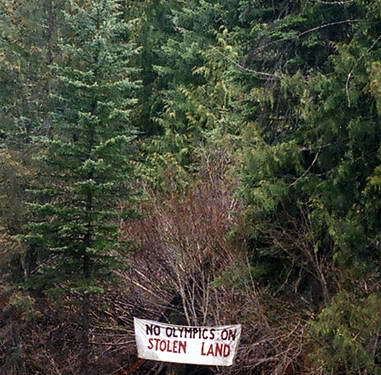 An Official Complaint was submitted to the International Olympics Committee in June 2002 regarding indigenous concerns about the environment and Aboriginal Title and Rights. "We call the Grizzly our brother, and so are using them as an umbrella species. 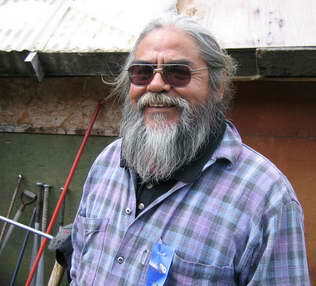 If you look after the Grizzlies, everything else will be looked after" (Randy James, Tsal'álh). See the map: Grizzly Protection Areas (St'át'imc Land and Resource Authority). "We, the St'át'imc view our territory as the basis for our survival. We acknowledge the creator and our responsibility as caretakers of our territory. We are inseparably connected to our land, its water, air, wildlfe and plants. What happens to one part impacts the other parts" Nxekmenlhkalha lti tmicwa. "Our people are not for treaties, because you're selling your title and the rights of your people, of your children and their grandchildren, even before they're born ... I look into the future and see destruction of our lands with false hope set upon our people like many years ago, when the white man first came and promised but gave only trinkets and beads and diseased blankets. The promise of jobs and money will last only for a few days and our land will be destroyed for hundreds of years" (Rosalin Sam, Sutikalh spokesperson). 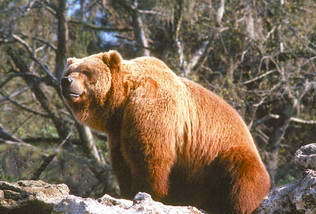 Grizzly bear in St'át'imc Territory. Sutikalh Camp, established 2 May 2000. Sutikalh watchman Hubert Jim, Lil'wat, 28 April 2006. 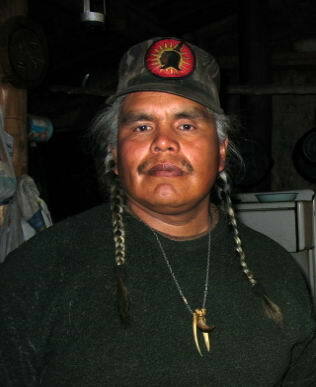 Tsal'´alh Chief Garry John, Sutikalh, 2006. Chief Garry John (left) is a speaker on Aboriginal Title and Rights for the Council of Canadians. "Our connection to the lands is not only spiritual; also there are the animals, the birds, the water, the fish, the medicines, the berries, and the trees. The name SUTIKALH means winter spirit, where our medicine people and ancestors went to stay for weeks and even years to learn of our songs, medicines. Today there are estken pits (pit houses) visible where they stayed. We have been using the lands for hundreds of years as we still use it in many ways today. Other religions went to churches we went to the mountains" Rosalin Sam, Sutikalh spokesperson. 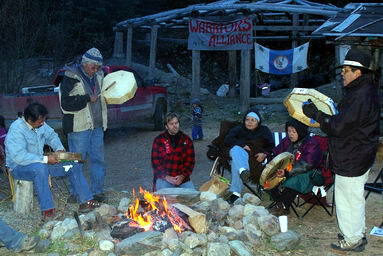 Rosalin Sam leading a drum song, Sutikalh, 2006. Sutikalh spokesperson Rosalin Sam, Lil'wat. 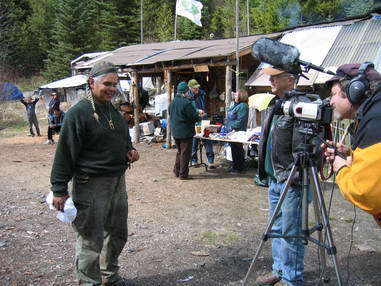 Sutikalh watchman Hubert Jim being interviewed, 2006. Sutikalh organizer Daniel Edmonds, Lil'wat. The development company (NGR Inc.) behind the planned Cayoosh Ski Resort in Melvin Creek is the same company involved in a bitter battle with the Secwepemc people over a $70 million expansion to the Sun Peaks Ski Resort near Kamloops. Disposition for ski development in BC is rubber stamped by the Commercial Alpine Ski Policy set up by the government to facilitate the selling, leasing and developing of Crown land that is - in fact - unceded indigenous land. 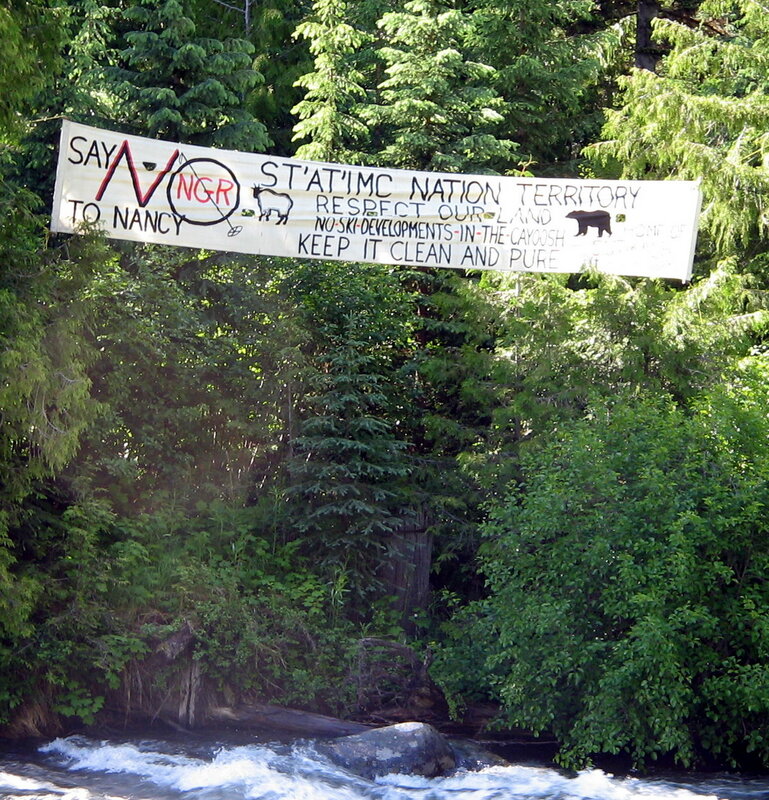 The Skwelkwek'welt Protection Centre was established in 2000 by Secwepemc traditionalists to assert Aboriginal Title and Rights and to oppose Sun Peaks. 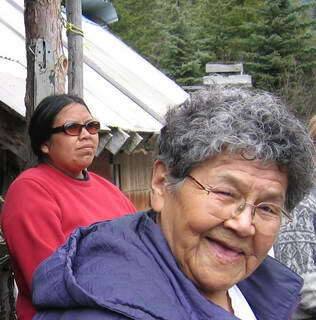 Elder Irene Billy (right) has endured many arrests for disobeying Sun Peaks injunctions and she came to Sutikalh with other Secwepemc in solidarity to celebrate its sixth anniversary on 2 May 2006. Non Aboriginal support: Sutikalh Solidarity (Resist Canada); Anarac (Carrie McNamara); Skisport in Britisch Kolumbien (Aktions gruppe Indianer, Germany); Surviving Canada (blog by M. Stainsby); Melvin Creek Blockade (FAN); Melvin Creek (SPEC); Barnard-Boecker Centre; and Visit to Sutikalh (International Peace Boat, Voyage 41). "Cayoosh Creek Gorge." Click forQuickTime. 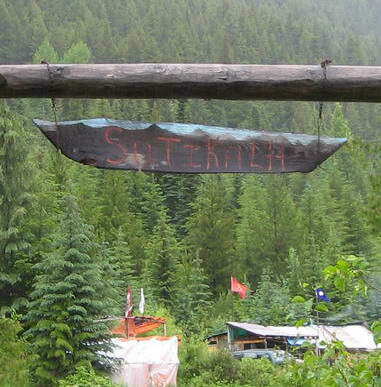 Land grabs and greed are behind rampant resort development in St'át'imc Territory: see Whistler (Virtual Guidebooks). In contrast, no development mars the Cayoosh Creek Gorge (left) in the Melvin Creek watershed: no resort condos, heli skiing, cat skiing, snowmobile and ATV touring, golf courses, etc. These environmentally destructive activities are not allowed in European high alpine areas yet in BC they are government sanctioned, driven by unethical real estate speculation. 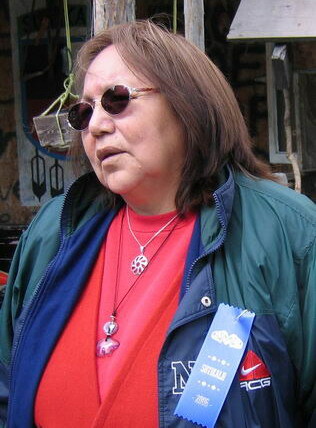 Skwelkwek'welt spokesperson Janice Billy, Sutikalh, 2006. 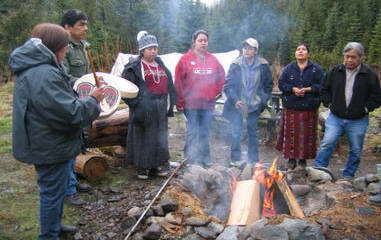 Janice Billy (left) is the Secwepemc spokesperson for the Skwelkwek'welt Protection Centre which is signatory with Sutikalh, House of Smayusta and Pilalt Nation to the Joint Submission to the UN Committee on Economic, Social and Cultural Rights submitted May 2006 in Geneva, Switzerland: Indigenous Network on Economies and Trade. Sutikalh, Home of the Winter Spirit. Sixth Anniversary Celebration, 28 April - 2 May 2006. Sutikalh was declared a Settlement area by a unanimous vote of the St'at'imc Chiefs Council on 3 April 2007. 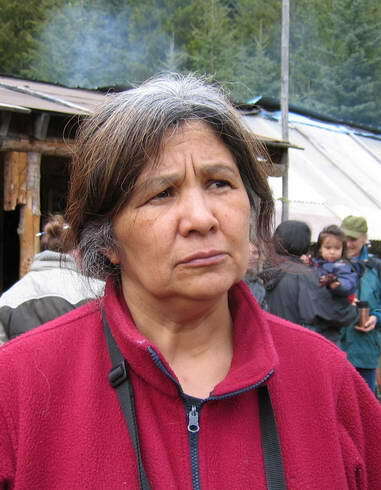 Spokesperson Ros Sam successfully steered the proposal through the Nxekmenlhkálha lti tmícwa land use plan application process; "In a motion made by Chief Perry Redan and seconded by Chief Garry John, to establish Sutikalh as a 'Settlement Area' so that we can build infrastructure, have water rights, wood permits, and set up our boundaries, so that we may be able to protect what is rightfully ours with the authority of the St'at'imc Chiefs Council."